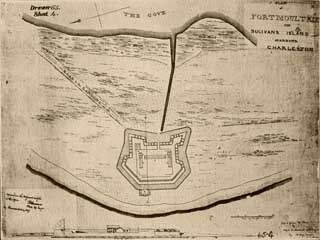 The second version of Fort Moultrie, a five-sided redoubt erected a decade-and-a-half after the American Revolutionary War had ended, was leveled less than six years later by a huge hurricane which roared through South Carolina in September 1804. 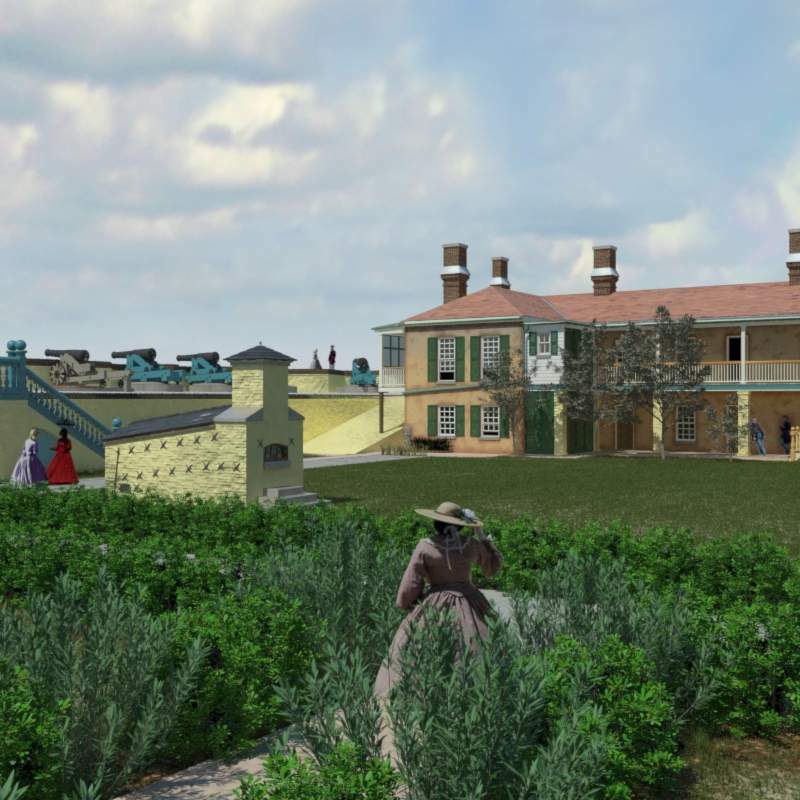 The state government therefore sought a more permanent replacement from Washington, ceding the necessary lands on lonely windswept Sullivan’s Island at the entrance into Charleston Harbor to Federal jurisdiction, so that a third fort might be built there. 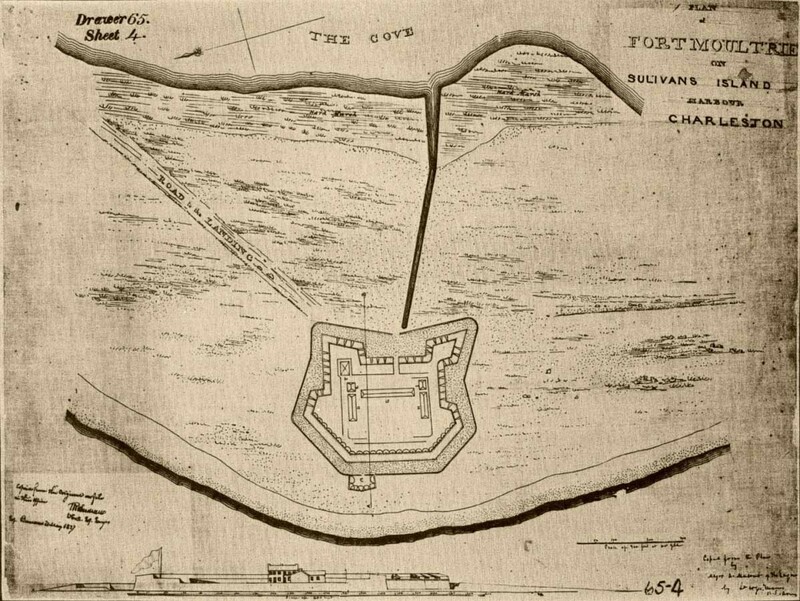 The resultant six-sided fortification was duly completed by December 1809, under the supervision of Capt. Alexander Macomb — a 27-year-old officer in the U.S. 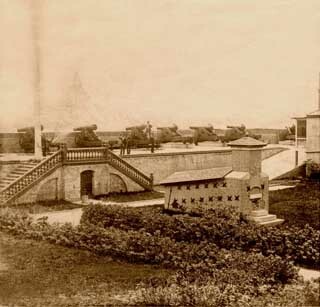 Corps of Engineers — as part of a nation-wide string of enhanced coastal defenses known as the “Second System.” This new stronghold on Sullivan’s Island had been constructed using some materials salvaged from the second fort’s ruins, and had been raised only a short distance behind it, due to the commanding position beside the harbor entrance along its particular stretch of low shoreline. 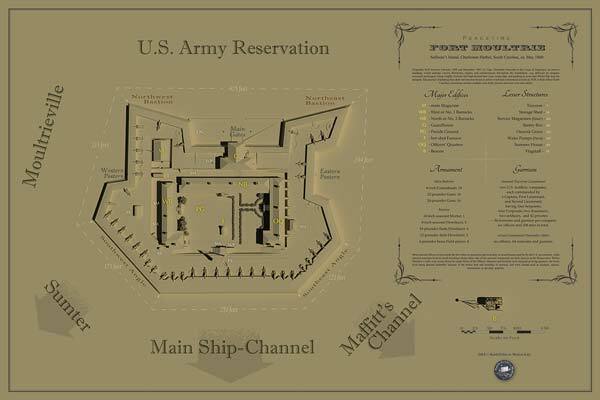 This final structure (commonly known to historians as “Fort Moultrie No. 3”) measured slightly more than 400 feet at its widest point, with ramparts fifteen feet high and packed with sandy soil between triple courses of heavy brick, topped around its outer edges by granite coping-stones. The upper slopes of Moultrie’s ramparts were furthermore sodded with grass, so as to retain this filler-soil in place. 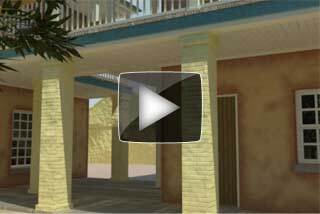 For a more detailed summary of major dates associated with the design, erection, and subsequent evolution of Fort Moultrie No. 3 ever since 1804, please visit our General Timeline page. …was originally built by the engineers as a mere sea-battery, with just sufficient strength to prevent it from being taken by a coup de main. As an overpowering force of militia could always be summoned for its defense, it was supposed that no foreign army would ever attempt to besiege it. This rebuilt fortification would undergo various additions, alterations, improvements, and repairs during its initial half-century, and had even lain vacant for more than six years (between January 1836 and June 1842) while a large breakwater had been installed to check an encroaching threat from seaside erosion. 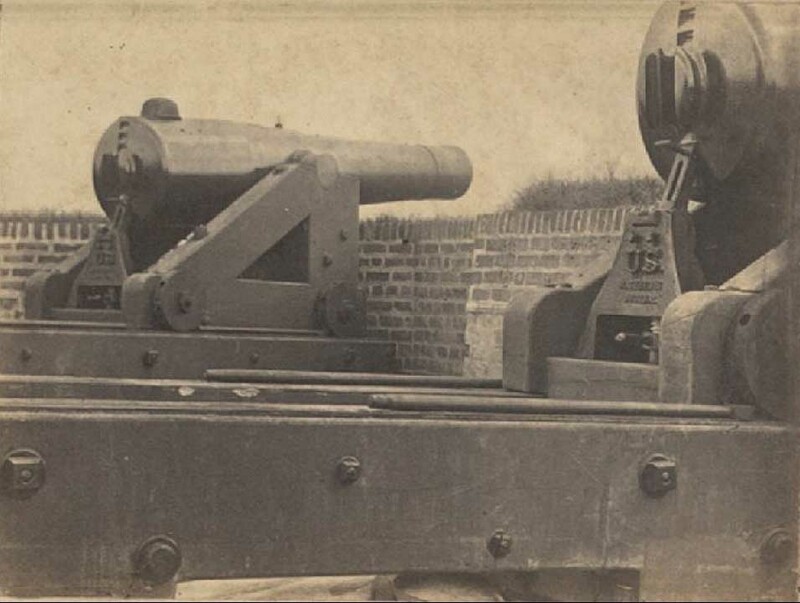 Fort Moultrie was designed to mount its artillery en barbette, a French military expression meaning that only its gun-barrels would protrude above its parapets, allowing their crews to work in relative safely behind its walls, protected from any flat-trajectory counter-fire. 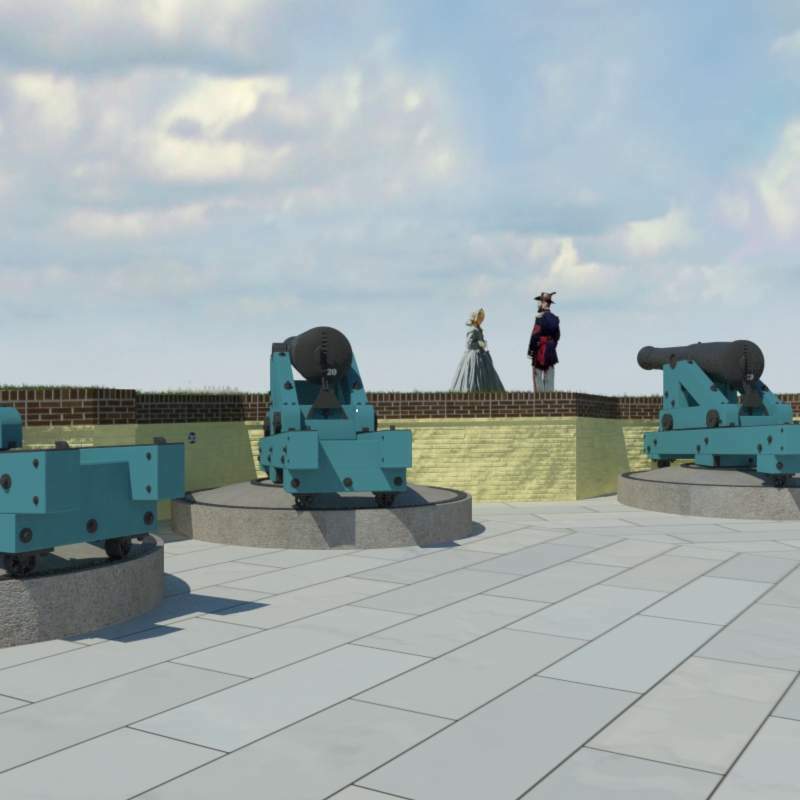 Each cannon would therefore have to be initially hoisted and carefully balanced atop a large wooden carriage, which could then be traversed from side-to-side from a fixed pintle at its front point, so as to be aimed. A total of 47 such gun-positions had been laid out around its parapets, with room for several more. 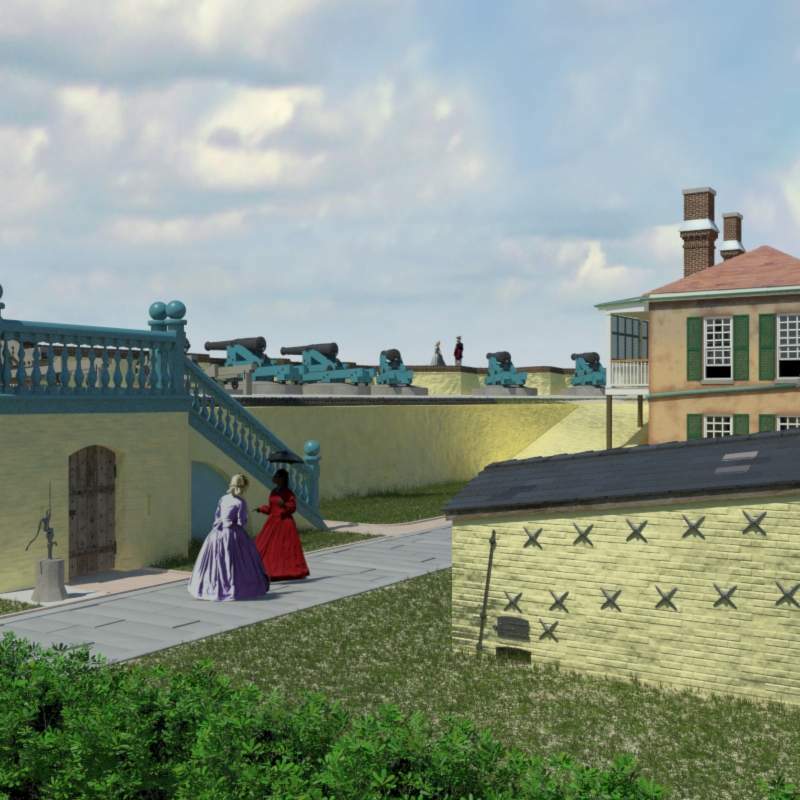 For a more detailed description of the various changes and improvements made over the ensuing decades to Fort Moultrie No. 3, please visit our Old Photos & Maps page. Yet Moultrie’s allotted armament normally consisted of only 40 heavy pieces, plus a few lighter howitzers parked in an open-air compound to its rear, known as the Reservation. 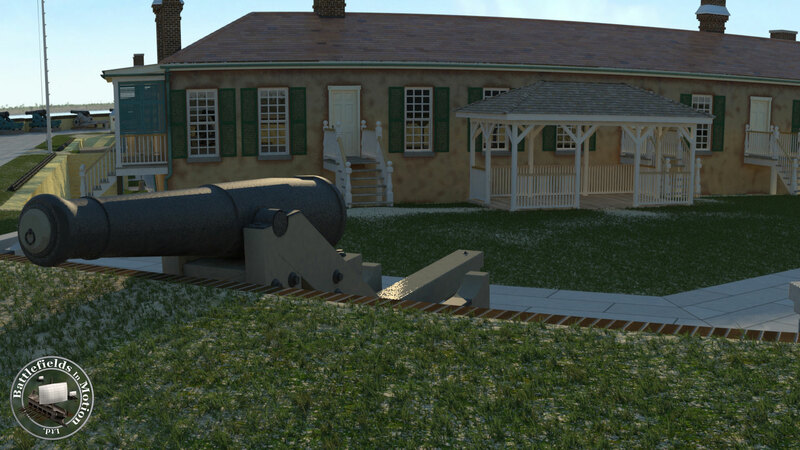 The fort’s last ordnance upgrade had been completed by mid-November 1859, when — after several delays — ten 8-inch Columbiad guns had been installed atop specially-cut round granite bases, ensconced at both its Southeast and Southwest Angles. In addition to these new weapons, Moultrie’s ramparts also featured fourteen older 32-pounders and sixteen 24-pounders. However, the small size of its peacetime U.S. Army garrison meant that there were never enough gunners to operate more than a few pieces at a time, regulations requiring that each cannon be worked by a five-man crew. Most of Moultrie’s artillery therefore remained idle under wooden pent-covers, only its Main Channel guns between Positions 20 to 28 being regularly used in exercises — yet rarely if ever test-fired, because of the expense involved and disturbance which it might cause among well-to-do civilian neighbors. 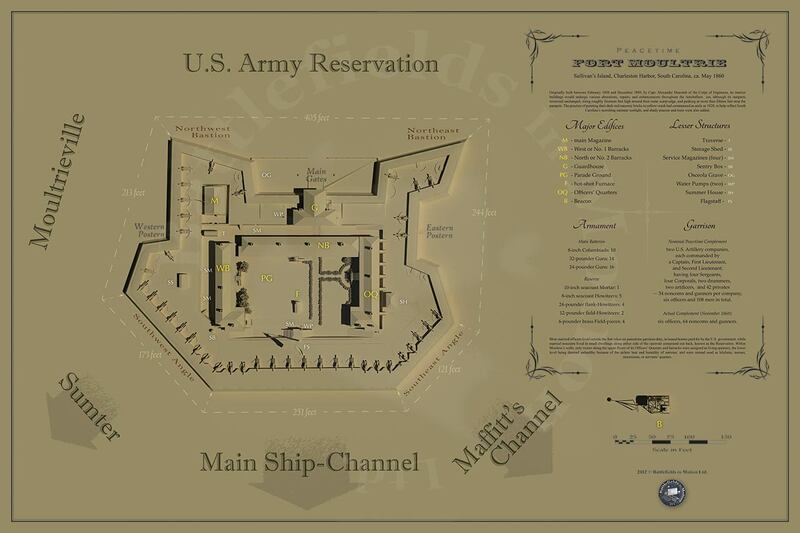 Fort Moultrie served as the headquarters for all U.S. Army installations around Charleston Harbor, and thus housed its only body of regular troops: two companies of the 1st U.S. Artillery Regiment, under the command ever since late 1857 of the second-ranking officer for that regiment, Lt.-Col. John Lane Gardner. Both units, Companies E and H of the 1st Artillery, had already been a bit under-strength when rotated out from Florida in June 1858, and were then further decimated by a yellow-fever epidemic which struck Moultrie that same September, infecting 49 soldiers and eventually claiming the lives of 28 of its gunners. Most of these deceased had been hastily buried outside its walls, until this terrible outbreak finally abated. The two companies had still not recuperated from these losses by the spring of 1860, despite the fact that regulations called for each to be comprised of four sergeants, four corporals, two drummers, two artificers, and 42 privates — 54 men per company, 108 in all comprising a full complement. Yet as late as November 1860, an inspection found that Companies E and H together could muster only 64 noncoms and soldiers between them, and a mere 21 gunners for an artillery drill — scarcely enough to operate four guns. Most of these rank-and-file gunners were impoverished young immigrants born in Ireland or Germany, who had enlisted for five-year stretches. They were awakened at Moultrie every morning at 6:00 a.m. by the beat of a drum, having a half-hour to wash and dress in their dark-blue uniforms with red trim, police their barracks, then fall in for breakfast. Different drum-rolls would then lead them through their various daily routines and drills, with breaks for lunch and supper, before “retreat” was finally played, a roll-call held, and the flag lowered at sundown — after which one final tattoo marked the end of their day. This tedious routine on lonely Sullivan’s Island bred instances of misbehavior and drunkenness, punctuated by occasional flashes of violence or desertion. They usually received their pay at the beginning of every other month, after which desertions often occurred. For most U.S. Army officers, Fort Moultrie was considered by the mid-19th Century to be a very quiet posting, no foreign enemy having even remotely threatened Charleston Harbor in many years, so that peacetime garrison-duty was fairly undemanding. 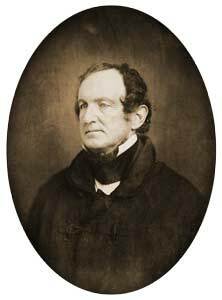 Disease represented the greatest single threat, a dengue epidemic having swept through in August 1850 which infected all but ten of its 48 resident officers and men, as well as 43 women and children — although fortunately, nobody died. Two years later, yellow fever infected 33 of Moultrie’s reinforced garrison of 106 men, and four succumbed. And as noted above, the epidemic of 1858 proved much deadlier still, laying low half the garrison and claiming 28 lives. With no firm scientific knowledge as to contagious origins, such outbreaks had been partially attributed to the fort’s enclosed compound, long considered so unhealthy — especially during the suffocating heat and humidity of South Carolina’s summers — that senior staff were allowed to live off-base in civilian houses with their leases paid by the U.S. government. 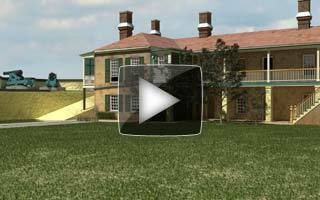 Gardner himself resided with his wife and middle daughter Caroline in a fine big house beside Moultrie, directly across the sandy street from its western postern entrance. Doubleday, the garrison’s next senior officer and thus second-in-command, actually lived within the fort with his wife Mary, managing its day-to-day affairs. Some married noncoms and auxiliary personnel were also allotted housing in the open Reservation behind Moultrie, while only the top floor of the residences inside the fort’s walls were ever assigned as living-quarters, the damp lower rooms being deemed uninhabitable and thus used only for kitchens, messes, storerooms, or servants’ quarters. Moultrieville, on Sullivan’s Island quite near the fort, was at that time a place of fashionable resort during the summer season for the wealthy families of Charleston and South Carolina generally, many of whom had temporary residences there, to which they removed on the approach of hot weather to escape from the malarious influences of the city and lower country, and enjoy the cool breezes and the sea-bathing. Officers of the army were at that time sought after and hospitably entertained by nearly all of the better classes of society in the South, and Lieutenant Sherman was thus, upon his arrival at Fort Moultrie, ushered into a life entirely new to him. 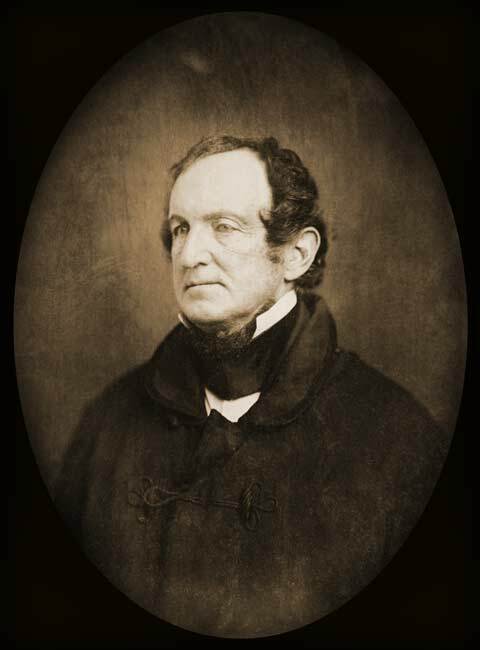 During the summer [of 1842] he made many agreeable and some valuable acquaintances, which were cemented and extended during the following winter when he, in common with the other officers, was almost overwhelmed with invitations to accept the hospitalities of the citizens of Charleston to whom they had been attentive at the fort. 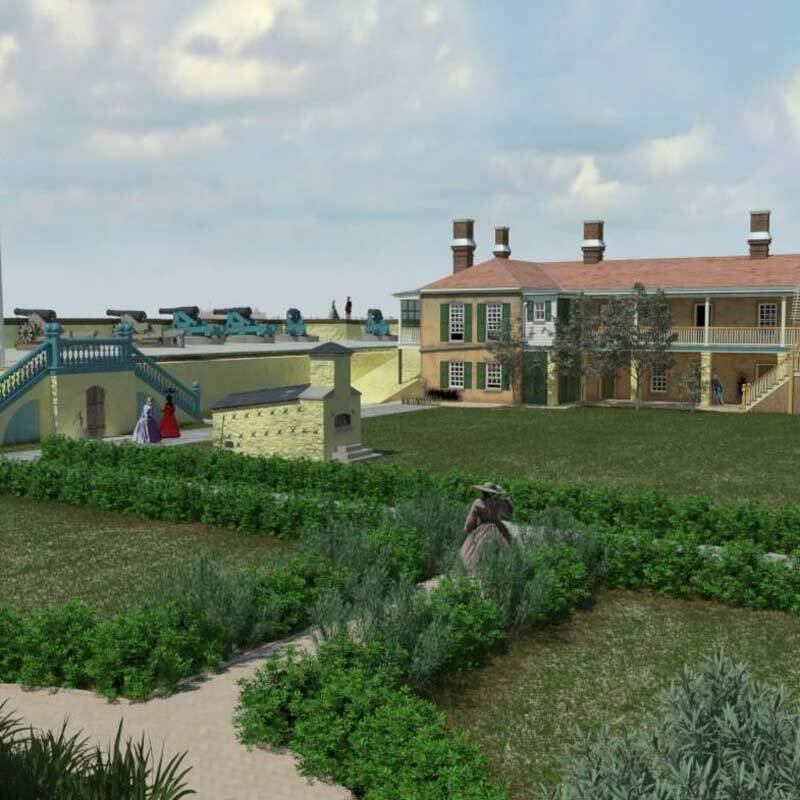 The reason for such intimate contacts between Moultrie’s officers and the surrounding civilian population, was that Sullivan’s Island had become a favorite summertime resort for South Carolina’s elite. 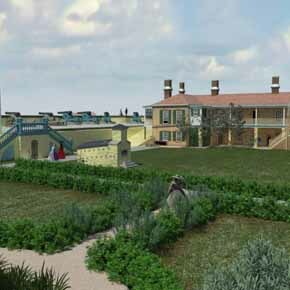 Wealthy landowners and traders had built and maintained a sprawl of fine cottages on both sides of the fort, into which they retreated with their families to while away the hottest months. The island furthermore provided a popular destination for cross-harbor visitors from Charleston, a ferry regularly disgorging large numbers of tourists or picnickers at Moultrieville, who strolled through the town to enjoy its ocean shores. And some distance beyond the fort loomed the large Moultrie House hotel, which had opened its doors in July 1850 and usually accommodated a couple of hundred paying-guests, who enjoyed its spectacular views in addition to a billiards room, bowling alley, and shooting gallery. Yet already a half-century old by the spring of 1860, the fort was scheduled to soon be superseded. The development of high-explosive shells in the decades since Moultrie’s erection, fired by ever-larger and more powerful guns, meant that its design had become outdated. Much larger and more resistant Fort Sumter was therefore under construction a mile away, slowly approaching completion across the waters deeper inside the bay, into which the main U.S. garrison would eventually have to be relocated. But much remained to happen within the next few months, before that shift could occur.